Lt. Governor Gavin Newsom has a nonprofit that can accept contributions that exceed political contributions limits and that can keep from public view how it is spending its funds, CitiReport has learned. The 2010 Lieutenant Governor Inaugural Fund, known also as the Lieutenant Governor’s Host Committee, was established in September 2010 as a 501(c)4 tax-exempt nonprofit that supports “community and neighborhood development.” Under Internal Revenue Service rules, donors can not take a tax deduction for contributions to the committee, but the committee itself is exempt from taxes. It is not required to disclose donors or expenditures under federal rules. Under separate California law, Newsom is required to report within 30 days any contributions of $5,000 or more made to a committee he controls, such as this one, but is not required to report how it spends its funds. Federal rules allow the committee to be involved in political activity and lobbying; California rules require political expenditures to be reported and to report lobbying activity. However, Newsom would still be allowed to engage in public relations or even activities involving the America’s Cup promotion without public disclosures. Newsom could spend the funds for a wide range of other purposes, including hiring outside staff, public relations consultants, or other expenses. Newsom, as San Francisco’s mayor, sought to build a national reputation on transparency and public disclosure on governmental activities but usually refused to make public his own records, including his cell phone records or a full daily calendar even when it involved official business. Newsom’s committee has reported contributions of $5,000 or more totaling $102,900 as of February 28, 2011. The largest contribution — $50,000 — came from Frank L. Burrell, Jr. Newsom also reported a $25,000 contribution from A&T. In January, the America’s Cup committee announced the appointment of Newsom as the “first ever” Ambassador at Large. Neither the Committee nor Newsom have announced the terms of the appointment, including whether Newsom will be paid a stipend, expenses, staff or office costs. The deal calls for Newsom to “assist in attracting and welcoming visitors from other states and abroad to California and San Francisco for America’s Cup events,” according to an America’s Cup release January 12, 2011. 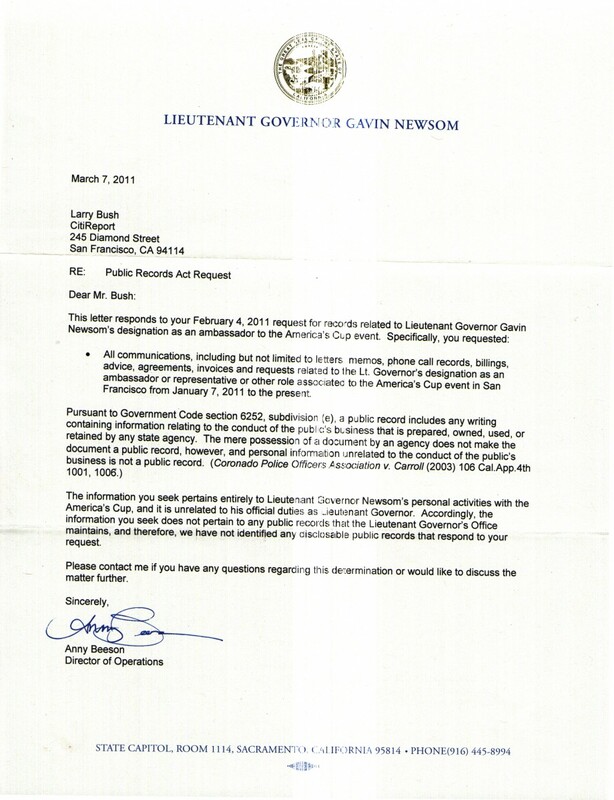 Gavin Newsom’s Lt. Governor’s office writes CitiReport that records on Newsom’s deal to be the America’s Cup Ambassador at Large won’t be coming from them. The America’s Cup committee will benefit financially from visitors for the events under terms signed by then-mayor Gavin Newsom. According to the City Planning Department documents, over 100,000 are expected at viewing areas and stands for corporate sponsors and VIPs under the control of America’s Cup officials. Areas range from Crissy Field to the Marina Green to Aquatic Park and along the northern waterfront piers. Increased participation by contestants also factors into the America’s Cup bottom line. 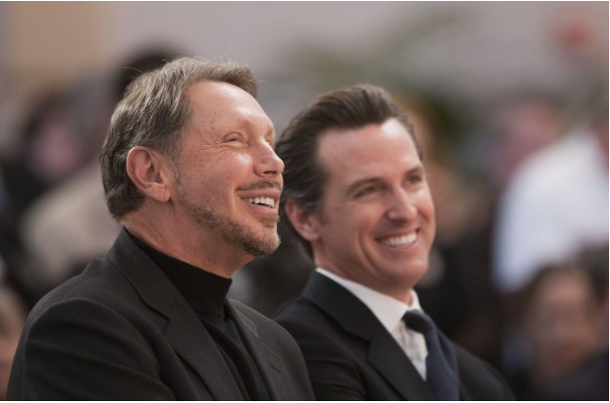 Newsom’s final sign-off on the America’s Cup contract with San Francisco boosted their profit line at the expense of revenue that would have come to San Francisco, according to Board of Supervisors Budget Analyst Harvey Rose. The results, Rose reported to the Board, could amount to several million dollars a year in lower revenues to the City. The San Francisco Examiner noted that the City Attorney’s office interpreted Newsom’s authority to allow him to close a deal that increased profits for Ellison so long as it did not increase costs to the City. “Deputy City Attorney Jesse Smith said the wording of the board’s version only limited the mayoral administration from negotiating to increase The City’s costs, but did not prohibit The City from agreeing to lower profits — though he declined to say that is what occurred,” the paper reported in its March 13 edition. San Francisco Mayor Ed Lee’s office provided CitiReport with copies of agendas and documents it holds but no information was included on the discussions with the America’s Cup representatives. While the Board of Supervisors has the ability to inquire into the terms of Newsom’s deal, the only guarantee that the public will learn if Newsom receives any compensation or expenses will have to wait until April 2012, when Lieutenant Governor Newsom will be required to file his annual Statement of Economic Interests for 2011. Newsom previously established committees for his 2004 and 2008 inaugural costs, also as 501(c)4 entities, with attorney James Sutton as the contact. Sutton is also the contact for this new committee. Newsom’s 2004 committee ran into controversy when the 2004 committee records were sent to the San Francisco Ethics Commission and appeared to show Newsom was using its funds to pay off campaign debts, which was a violation of campaign laws. The Ethics Commission’s deputy director, Mabel Ng, ruled that the records were sent in error and were prelimary and ordered them destroyed. A complaint was filed against Ng with the Sunshine Ordinance Task Force that concluded Ng has violated the city’s sunshine laws. It forwarded the finding, as required by city policy, to the Ethics Commission for action. No action was taken.